Pedal Bear smile. Photo courtesy Crank Art Collective. Pedal Bear looking up. Photo courtesy Crank Art Collective. 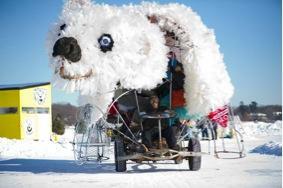 Pedal Bear is a VW chassis powered by 10 bicyclists. Built mostly of recycled materials, the bear will serve as an environmental ambassador, stimulating conversation about changing climate, alternative modes of transportation, and the innovative use of recycled materials. Lights and a sound system will be added for the Northern Spark Festival on the Greenway. 9:01 p.m. – 11 p.m. / Northern Spark Coffee Garden, hosted by Peace Coffee at their HQ & Roastery at 2801 21st Avenue South (near 28th street and Hiawatha). In the parking lot of the Greenway building. 11:30 p.m. – 1:30 a.m. / In the Greenway near Chicago Avenue. One block West of the Freewheel Midtown Bike Center and the Midtown Greenway Coalition HQ. 2:00 a.m. – 3:30 a.m. / Kix Field, on the Greenway near 4th and 5th Avenues. 4 a.m. – 5:26 a.m. / Northern Spark Coffee Garden, hosted by Peace Coffee at their HQ & Roastery at 2801 21st Avenue South (near 28th street and Hiawatha). In the parking lot of the Greenway building.